The share menu allows you to share the selected song or songs in the selected set. From here you can export, email, print, and share wirelessly. Export the current song or set to iTunes file sharing, Dropbox, and other online services. Send your set as attachments to your team. Post to Twitter or Facebook and share your set list with your friends and followers. Output your songs, sets, or books to paper. Choose from chord charts or a song list. Open exported formats into other apps. 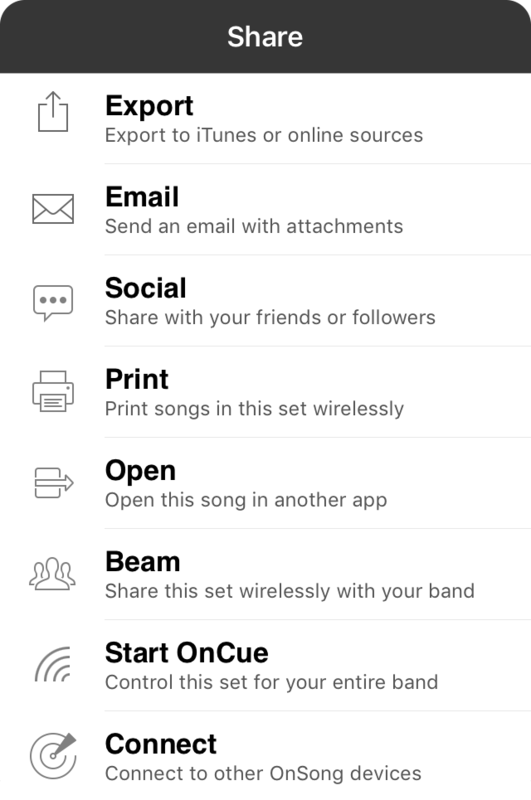 Beam your songs or sets wirelessly to other OnSong users. Allows you to stream your currently viewed song to other users of OnSong. This keeps everyone on the same page. Connect to other devices using OnSong's robust Connect protocol over WiFi.